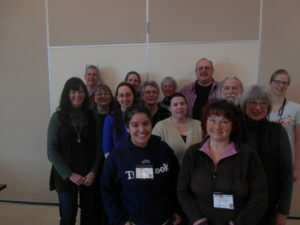 Sixteen members of the 2017 Oregon State University Tillamook Master Gardener Class completed their basic training course work in gardening and plant problem solving on Thursday, March 30th and were awarded Certificates of Home Horticulture. Members of the class will continue their training by working with Certified Master Gardeners answering home horticulture questions for the general public. They will be available in the Master Gardener Office at the OSU Extension Service at 4506 Third Street on Monday, Wednesday and Thursdays from 12:30 to 4:30 P.M. The newly educated Master Gardener trainees will also be available to take your plant questions at clinics at Farmers Markets in Tillamook, Pacific City and Manzanita, working at the Master Gardener Learning Garden at the Tillamook County Fairgrounds and an assortment of projects and horticulture educational events and plant clinics.